Convenient parking is available for Tranquility Park in downtown Houston. View the map shown for more information on all parking options, including rates, hours of operations, and entrances. 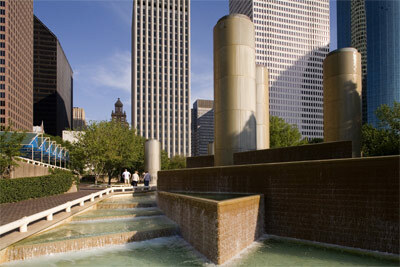 Tranquility Park is an urban oasis located in the heart of downtown Houston, next to the Houston City Hall building. Named for the Sea of Tranquility, the park features serene pools, fountains, and walkways that were built to commemorate the first lunar landing by Apollo 11. Each year, the park plays host to a variety of events, including the Children's Festival and Houston International Festival.